Imagine a yard littered with rusted out cars, with a burnt old house bulldozed to the roadside. Does this conjure up the perfect site to build a dream house? Jim and Audrey Hartin could see beyond the rubbish of the junk-riddled old homestead to the gently rolling land and mature trees. The Hartins set out several years ago to build their dream home on acreage northeast of Columbia, S.C. 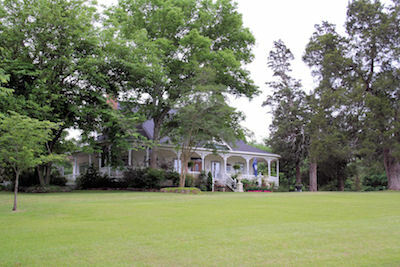 The resulting Victorian house, with its wrap-around porch, looks like a restoration, not a replica, setting on the hillside within the shade of the ancient cedars, crape myrtles, hickories, black walnut, and old mulberry tree. Their vision has included a parterre garden surrounded by a picket fence. Old roses bloom among the bulbs, perennial daylilies, shrubs, and seasonal annuals planted for color in the formal beds. 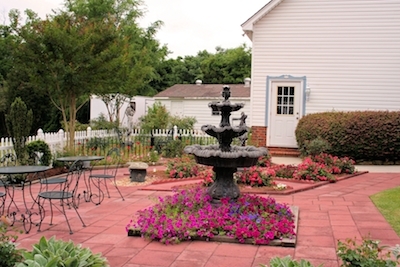 An ornate Victorian pergola is the centerpiece of the side yard. Nearby, a small garden house, decked out in gingerbread details, exudes Victorian charm. It has its own picket-fenced garden, and a porch complete with rocking chair. Brides and photographers have discovered these settings make for romantic bridal shoots. The lady of the original homestead planted the ancient trees. Black walnut tree roots exude a substance that kills most plants trying to grow under them. Jim said they kept experimenting to find plants that would survive, and have had success with spiraea, ivy, nandina, and plum yew. 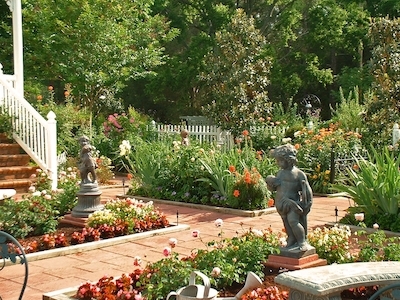 The garden originator also lined her driveway with narcissus, which still come up and bloom every year, marking both sides of the old circular driveway. The gardens are a mutual endeavor. “It’s a joint effort; it’s my wife and I. It is a love that both of us have. I think that is so important that we both share the same hobbies, interests, and things like that. She’s the one with the knowledge about the plants and I’m the hole digger and put it where she wants it and that kind of thing,” he chuckled. Charleston Urns, near the front door, ooze yellow pansies in the winter and fill up with spikes of purple diascia, large leaved angel wing begonias sporting red flowers, and variegated vinca, trailing to the ground by summer’s end. Tall snapdragon flowers show off vibrant blossoms of red, pink, and yellow well into May. Jim advises planting the snapdragons in the fall, the same time as the pansies. “You can get them in the spring, but they don’t do nearly as well. They need to over-winter to set their roots and get stronger. That way they get taller and they won’t topple over. The junkyard has given way to small linen and lace covered tables set with china, ready for tea. A lawn sweeps up to the house. Flowers bloom in well-tended beds. A new queen crowns the land where rust and rubble once reigned. NOTE: This article first appeared in South Carolina Homes & Gardens magazine.